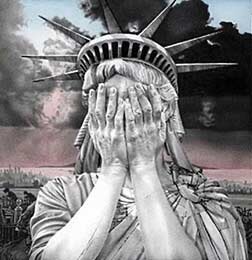 Liberty – Gee Vaucher. Gouache and pencil on paper. This entry was posted on Thursday, March 16th, 2017 at 11:12 am	and tagged with liberty, lies, Poetry, politics, Tetractys and posted in Social Issues, Tetractys. You can follow any responses to this entry through the RSS 2.0 feed. There is a certain irony in ‘hope is death’ — it made me pause. A powerful poem in an interesting form.